Perhaps you suffer from chronic headaches or neck pain. Maybe you wake up with a feeling of soreness on one side of your face or jaw. On the other hand, perhaps your spouse has mentioned hearing you grind your teeth at night. Each of these circumstances can cause pain and discomfort within the temporomandibular joint. Dear Doctor describes the unique character of TMD, which is Temporomandibular Joint Disorder. The TM joint, or jaw joint, is stabilized and moved in the same way as other joints in the body—through ligaments and muscles. Yet, when there is a problem within the joint and the attached muscles, individuals experience a range of painful symptoms. The perplexing aspect of TMD is that many structures are at play. For instance, the jaw system encompasses the TM joint itself, along with the teeth and sinus cavity. In addition, the cervical region of the neck and upper back “share” nerves with the TM joint, making it difficult to understand or classify TMD. What’s more is that a person’s psychological state is also believed to play a role in TMD. In other words, there is a strong link between stress and the onset of TMD symptoms and pain. To better understand, some individuals experience digestive problems in response to stress, while others experience sleeplessness, irritability or even skin rashes. Yet, dentists report that a large majority of dental patients grind or clench their teeth, leading to TMD symptoms. Surprising to some, the force generated by clenching the teeth is enough to cause intense jaw and facial pain, muscle spasms, neck pain, headaches and may even cause damage to teeth. 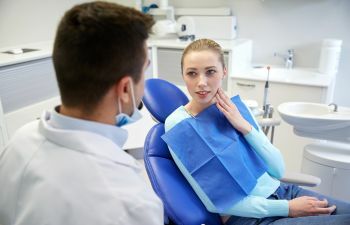 Even so, because the symptoms of TMD are non-specific and could indicate another condition, it is often confused or misinterpreted as something else. Ultimately, a thorough health and dental history is the best way to accurately diagnose TMD. Without question, dentists are well equipped to help patients navigate the complexities of TMD and find relief from their symptoms. Welcome to Kennesaw Mountain Dental Associates, where you’ll experience high quality dentistry in a warm environment. Dr. Hamir Contractor, Dr. Suhasini Arun and the talented team of dental care professionals understand the devastating effects of TMD. Thus, if you’re suffering from symptoms related to TMD, you’ll be glad to know that there is treatment to help alleviate your pain.